After a two year break the successful “Bolshoi Ballet HD Collection”, released by the Paris-based video label BelAir Classiques, is back on track again with Dmitri Shostakovich’s The Golden Age, the last ballet from long-time Bolshoi director Yuri Grigorovich. “Last” may be somewhat misleading here, since The Golden Age – or The Age of Gold, as may be more common – was premiered as long ago as 1982, but turned out to be the final original creation of the Bolshoi master. And come to think of it, the age wasn’t particularly golden at the time of the ballet’s premiere, as criticism against Grigorovich’s authoritative rule and artistic output was gradually mounting and would eventually lead to his eviction some ten years later – but that’s another story. Fact is, most of Grigorovich’s ballets remained in the Bolshoi repertory, often resurfacing after several years in a more or less updated guise. 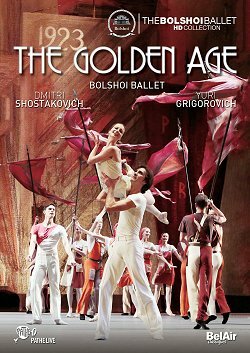 The Golden Age is performed only by the Bolshoi and has unlike other Grigorovich’s ballets never been staged elsewhere. In Moscow it was last danced ten years ago and recently revived again in the lead-up to the 90th anniversary celebrations of the choreographer earlier this year. While undoubtedly not a masterpiece, this is the first official release of the ballet on Blu-ray and DVD and will be most welcome to all devotees of the Bolshoi and Russian ballet. Grigorovich’s The Golden Age is itself an adaptation of the 1930 production, which like all evening-length ballets composed by Dmitri Shostakovich fell out of grace and was banned soon after the premiere. The blatant Communist rejection of so-called bourgeois decadence of the original plot, culminating in a soccer match between soviet youths and bourgeois fascists, was recycled into a love story set against the conflict between pure white-clad fishermen and a depraved black-shirted gang of thugs in some 1920’s Russian seaport. It’s the same naive black and white opposition, but the luggage is far less heavy this time. The inclusion of references to Lenin’s New Economic Policy in the rework however will be lost on most viewers today. Seeing the ballet again, for all its simplicity, I still feel it is confusingly told, while much of Grigorovich’s stylized choreography is too crude and repetitive to survive the 100 or so minutes running time. As for the Bolshoi’s current take on it, I guess it helps if you haven’t seen the original casts in the 1980s. Today’s Ruslan Skvortsov, Nina Kaptsova, Mikhail Lobukhin and Ekaterina Krysanova are excellent dancers, yet none will ever erase memories of an Irek Mukhamedov or a Gediminas Taranda, who could transform cardboard into intensely potent characters. But that’s just how it goes with revivals: different times, different dancers, same ballets. Surprisingly perhaps for the Bolshoi, it are the quieter moments, like the love adagio’s between Kaptsova and Skvortsov, that work best here. This new installment in the “Bolshoi Ballet HD Collection”, filmed live in October 2016 on the smaller New Stage of the Bolshoi Theatre, is visually and soundwise a real treat. As we have come to expect from the Vincent Bataillon/François Duplat team The Golden Age offers a first-rate ballet-at-home experience. Thankfully gone are the days of shoddy Soviet filming, unable to master the frequent changes from bright to dark in these productions. The full HD transfer on Blu-ray looks particularly impressive with a wealth of detail and lovely, natural colors. Camerawork is as good as it gets with a well-judged mix between longshots and close-ups. The sonics are equally superb in the 5.1 DTS HD Master Audio mix, enhancing the impact of Shostakovich’s brilliant music. His ballet scores remain largely unknown to the general public, except perhaps in the form of suites. This is the young composer at his most confidently satirical, exemplifying in his music the capitalist depravity with a series of parodied western dance forms like polka, tango and foxtrot. Grigorovich interpolated the slow movements from Shostakovich’s Piano Concertos for the lyrical moments in his adaptation. Interestingly, they give the score which can at times sound relentless a rounder appearance. It all comes vividly alive by the Bolshoi Orchestra under Pavel Klinichev. This release comes without any extras. Bolshoi fans won’t hesitate to purchase this title, of course, and BelAir Classiques serves them well with splendid video and audio quality. Yet the older ones won’t be entirely convinced by the Bolshoi’s current way with The Golden Age. Categories: Blu-ray and DVD reviews | Tags: Age of Gold, BelAir Classiques, Bolshoi Ballet, Bolshoi Ballet HD Collection, Bolshoi Theatre, Bolshoi Theatre in Moscow, Dmitri Shostakovich, Dmitry Shostakovich, François Duplat, Marc Haegeman, Moscow, Pavel Klinichev, Russian art, Russian ballet, The Golden Age, USSR, Vincent Bataillon, Yuri Grigorovich | Permalink.